One small stretch of road in Baltimore County is claiming more lives than it should. 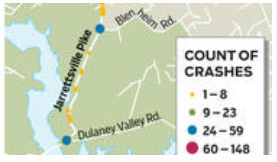 Auto accidents on Jarrettsville Pike in Phoenix, Maryland are averaging two per week, with 73 injuries in three years. There was one death in 2008, and four deaths this year. The Baltimore Sun discussed the history of this stretch of road in a recent article. Local residents know it as “Dead Man’s Curve.” The ominous nickname has been in place for many years, even before the government sent engineers to alleviate its most dangerous characteristics. Even now, the sharp turn, steep hill and obtrusive vision-limiting trees form equal parts of the injury equation. Inexperienced drivers, drivers unfamiliar with the layout of the curve, and drivers who should know better fall victim to the sudden turn and the inability to quickly slow down on the hill. The highway administration is quick to point out that the area is not defective, but they ignore the statistics. Are there cost-effective ways to make the area safer? Remove some of the surrounding trees so motorists can see dangers ahead, perhaps? The government has notice of the dangers, yet they choose to rest on the road change from the 1980’s. Motorists injured on Jarrettsville Pike may have an automobile accident claim against negligent motorists. In the right case, though, they may have a claim for defective roadway design against the government. That lawsuit will happen when someone is injured or killed in an auto collision, and the other negligent driver has insufficient insurance coverage to pay the claim. Maybe that’s what it’s going to take for change. Tagged: "Highway Design Defect" and "Road Defect"